See why kids (and adults) love chicken fingers! 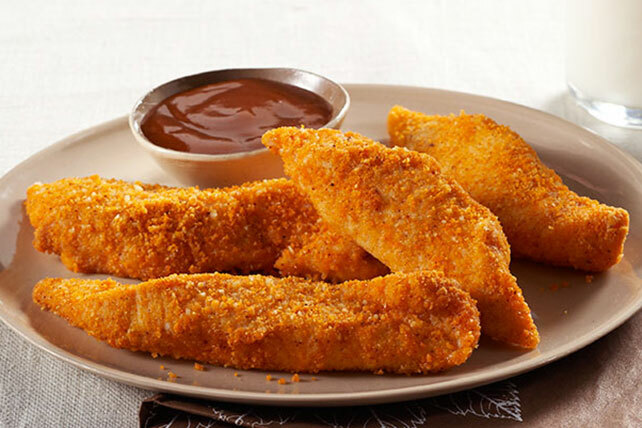 Turn to our Easy Chicken Fingers with Parmesan recipe for some chicken fingers the whole family will adore. Add cheese to coating mix in shaker bag. Moisten chicken with water; gently shake off excess water. Add 2 or 3 chicken strips to shaker bag; close bag and shake gently until evenly coated. Place in single layer on baking sheet sprayed with cooking spray. Repeat with remaining chicken. Discard any remaining coating mixture. Bake 12 to 14 min. or until chicken is done. Serve with barbecue sauce. Prepare using chicken tenders and/or your favorite variety of KRAFT Barbecue Sauce. Serve on lettuce-covered plates with small bowls of barbecue sauce on the side. Substitute KRAFT Classic Ranch Dressing for the barbecue sauce.